The complete list of the 10 antiquities from the Shelby White collection that are being returned to Italy has yet to be released. a. An Attic red-figured calyx-krater. Herakles slaying Kyknos. Euphronios. Discussed in Watson and Todeschini, The Medici Conspiracy 128-32. Illustrated in J. Boardman, The History of Greek Vases (London: Thames & Hudson, 2001), fig. 120. According to Watson and Todeschini, "Medici ... Hecht ... Summa Gallery"; then Hunt collection; Sotheby's (New York) June 19, 1990 (US $ 1.76 million); Robin Symes (on behalf of Leon Levy and Shelby White). Polaroids show in "dirty and in separate fragments". b. An Attic red-figured calyx-krater. A: Zeus and Ganymede. B: Herakles and Iolaos. Attributed to the Eucharides painter. Glories of the Past no. 117. The underside of the foot appears to carry an Etruscan graffito. Known from the Geneva Polaroids ("appears in fragments"). Watson and Todeschini have listed "Antiquities in the Levy-White Collection Shown in the Polaroids seized in Corridor 17 in Geneva". It is not known if any of these are included in the agreement. i. Bronze statue of naked youth. Glories of the Past no. 87. "This appears in three Polaroid photos and in about ten photographs in which the small bronze clearly appears still dirty with earth". Said to have been acquired from Robin Symes. ii. Chalcidian neck-amphora. Attributed to the painter of the Cambridge Hydria Cavalcade. Glories of the Past no. 102. "Appears among many seized photographs, where it is shown before proper restoration, with many gaps between the fragments." iii. Attic black-figured neck-amphora of Panathenaic shape. Attributed to the painter of Louvre F 6. Glories of the Past no. 104. Surfaced in Sotheby's (London) July 17, 1985, lot 313. "In the Polaroids, the amphora is broken and dirty with earth. In the other photographs ... it is shown as restored." iv. Attic black-figured neck-amphora. Attributed to the Bucci painter (by J. Robert Guy). Glories of the Past no. 106. Surfaced in Sotheby's (London) December 9, 1985, lot 132.
v. Attic black-figured neck-amphora. Attributed to a painter of the Medea group. 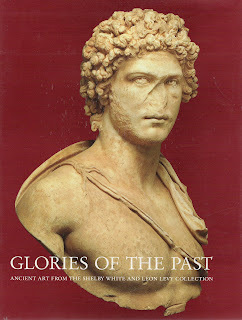 Glories of the Past no. 107. "In four seized Polaroid photographs." vi. Attic black-figured psykter. "Departure of a troop of cavalry". Glories of the Past no. 112. "The object in the seized photographs is completely fragmented and pictured on a kitchen tablecloth." vii. Two Caeretan hydriae. One showing a panther and lioness; the other showing Odysseus and Polyphemos' cave. "Both these vases were shown in the seized photographs, where they are both broken and in fragments, with sizable gaps." Mr. Rutelli went on to say, "Although Italy had no legal claims against Ms. White or her late husband, Leon Levy, she has shown great sensitivity in resolving this matter by concluding based on available evidence that these pieces should go back to the Republic of Italy. We look forward, as she has requested, to exhibiting these objects in museums [in] Italy." Ms. White said, "From the beginning, Leon and I collected with the intention of preserving the past, so that people around the world could learn more about their history. That's why we have supported many facets of archaeology -- excavations, publications, exhibitions, conservation, and education, and that is why we established the Institute for the Study of the Ancient World at New York University. Our collection was purchased at public auction and from dealers we believed to be reputable. In the case of the returned objects I believe I have taken the appropriate action. The mention of the Institute is key and probably explains why White has decided to offer up the pieces on a voluntary basis at this point. The Chippindale and Gill 2000 article, "Material Consequences of Contemporary Classical Collecting", in the American Journal of Archaeology (with supporting tables) is available on-line and from JSTOR. See now Tom Leonard, "New York collector to return 'looted' antiques", Daily Telegraph, January 18, 2008.